Marine veteran, Sgt Jack Groft served honorably as a “tunnel rat” during his service in Vietnam. He is lucky to be alive today! Suffering from several service-related conditions, his mobility has been greatly limited. 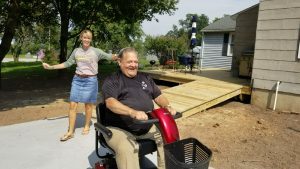 He was provided a scooter that assists him on trips to the VA or places he frequents that involve moderate to lengthy walking. However, he was not provided a manner in which to drive the scooter from his home to his car and vice versa. Family members would need to come to his home to lift the scooter on and off of his porch in order to load it to his vehicle. Roots for Boots was contacted by Sgt Bill Groft, Jack’s brother and fellow Marine, and inquired as to whether or not we could help. 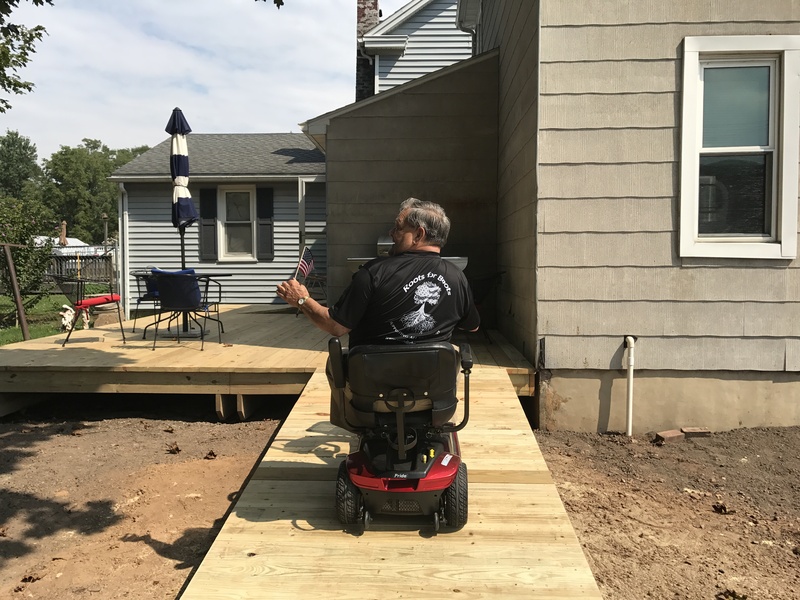 Working with local businesses and community members, the Roots for Boots way, we removed a crumbling concrete patio and replaced it with a beautiful wooden deck, ramp and concrete driveway. 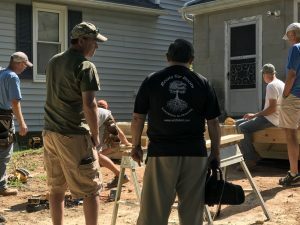 Special thank you to our community members who came out to volunteer and to our foreman, Erik Walton, who navigated the permit process for us, organized contractors and kept the momentum going! Jane Rice generously provided a beautiful patio set for Sgt Groft as well. He frequently sits outside on the deck with family or visitors and is able to independently enter and exit his home with his scooter. Sgt Groft’s family is relieved that he now has a safe path to and from his vehicle and has regained his independence. Happy trails Sgt Jack Groft!